The Purnima, or Poonam day, in the month of Bhadrapada or Bhadra is of great importance at the famous Ambaji Temple in Gujarat. Ambaji Bhadarvi Poonam festival 2019 date is September 14. Ambaji Temple in Banaskantha in Gujarat is one of the 51 Shakti Peethas (51 temples dedicated to Goddess Shakti in Hinduism) and is dedicated to Goddess Ambika. A 4-day Poonam festival is organized during the full moon day (Poornima) period in Bhadra month (August – September). More than a million people travel to the Ambaji Temple on the day, majority of them on foot, carrying religious flags. It is believed that the heart of Goddess Sati fell here, when her body was cut into pieces by Lord Vishnu to stop the intense tapas of Lord Shiva after Sati’s death. There is no idol in the temple and Goddess Ambika is represented by a triangular Vishwa Yantra, inscribed with figures and the syllable ‘Shree’ in the center. Legend has it that Lord Krishna Mata Ambika here and that Rukmani worshipped here prior to her marrying Krishna. Another legend states that the tonsure ceremony of Child Krishna was performed at Ambaji Temple. Shakti Swaroopini Mata Ambika, or Ma Ambaji, is an important female goddess in Shakti Cult and is also known as Amba Bhavani and Arasuri. What is done during Ambaji Bhadarvi Poonam? Mata is visited by scores of women devotees who follow the Padyatri Sangh from their region during the Bhadrapad Purnima festival. Ancient folk dance is a major event during the festival, which lasts for four days. Situated on the Arasur hill near Mount Abu, Ambaji Temple is located in Banaskantha District in Gujarat on the Gujarat – Rajasthan border. 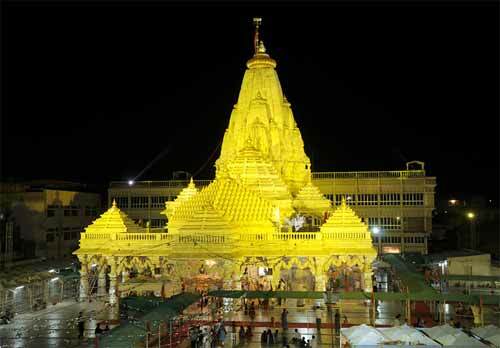 One can reach Ambaji Temple by buses from Ahmedabad and also through Rajasthan Roadways. Ambaji is around 20 km from Abu Road (Rajasthan), 21 km Danta by road and 50 km from Palanpur, an important town in Banaskantha District. The nearest Railway Station from Ambaji is Abu Road.